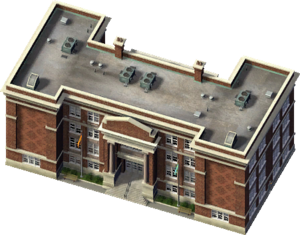 The High School is a Civic Building that provides Education to your Young Sims. In High School rankings, it is second only to the larger Large High School added in Rush Hour. The original name for this building was probably Large Grades 9-12 School before being changed to High School as its exemplar still contains this name. This also indicates that there was to be a wider range of Schools in the base game. A Larger High School was eventually added in SimCity 4 Rush Hour and the Deluxe Edition. This page was last modified on 2 August 2016, at 06:42.